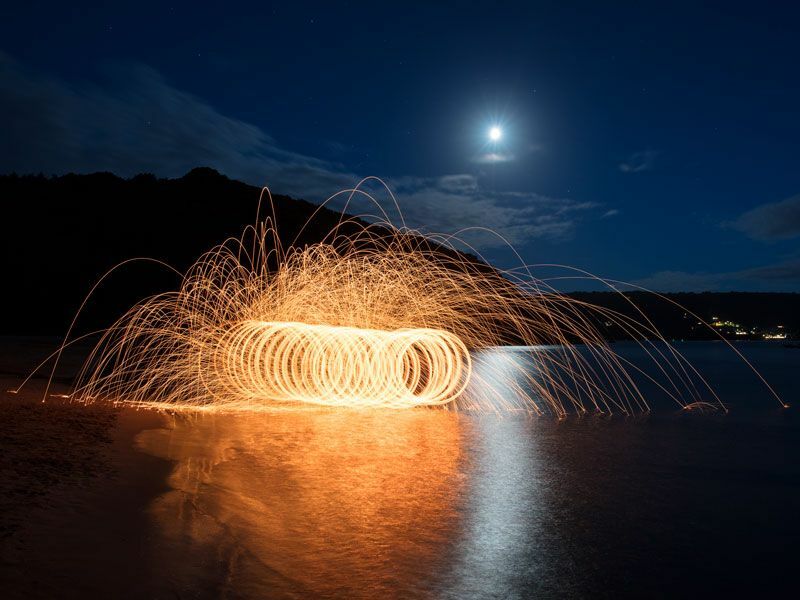 It’s amazing what you can create with a whisk, a dog lead, and some steel wool. 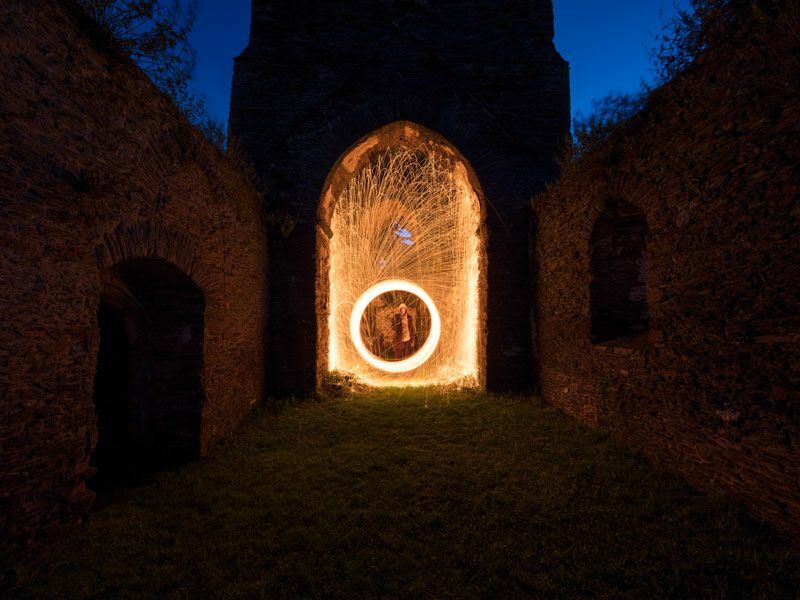 Steel wool burns at up to 700 degrees, but with it you can create some seriously cool images. First things first. Be careful. You are quite literally playing with fire. Make sure you pick a spot like a beach or somewhere with not much grass. You don’t want to set fire to the neighbour’s garden fence. You’re going to need some supplies. If you’re my son on his first attempt, you may also need to cover every spare inch of your body up, depending on how scared you feel. First, fluff out the steel wool a bit. Doing so will make more sparks, which means a more exciting image, then put it in the whisk. I tend to prepare two other whisks as you don’t have much time after the sky turns the nice dark blue which I think looks best. Attach the whisk to the dog lead, get used to the weight of it, have a few practise swings. For taking the picture, you’re going to need a tripod, timer, and, of course, your camera. A good place to start with settings is F.8 and ISO 200 for about 15 seconds. I used two different lenses, depending on whether I was waist deep in water or not: the 11-24, and the 24-70 lens, both by canon, to take the kind of pictures you can see on swimstones.com. Now, I have to say, be very careful. I think it’s best to take another person with you late at night. As I mentioned earlier I had my son with me who made a great assistant and didn’t burn either of our eyebrows off. 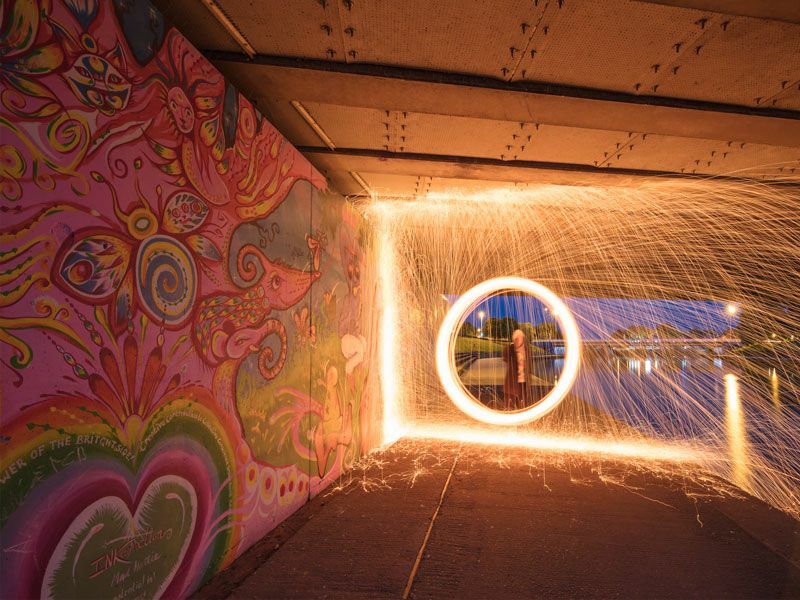 Have the other person stand in front of the camera, light the steel wool, and start swinging. Sparks will fly. After the wool has stopped burning, douse the steel wool with water and dispose of it in the steel tin. Don’t set fire to anything or stand on hot steel wool in the dark. It is a whole lot of fun, and every photographer should try it at least once.